Has the roof on your home started to leak? Maybe you’ve noticed stains on your home’s ceiling that came from a roof leak. 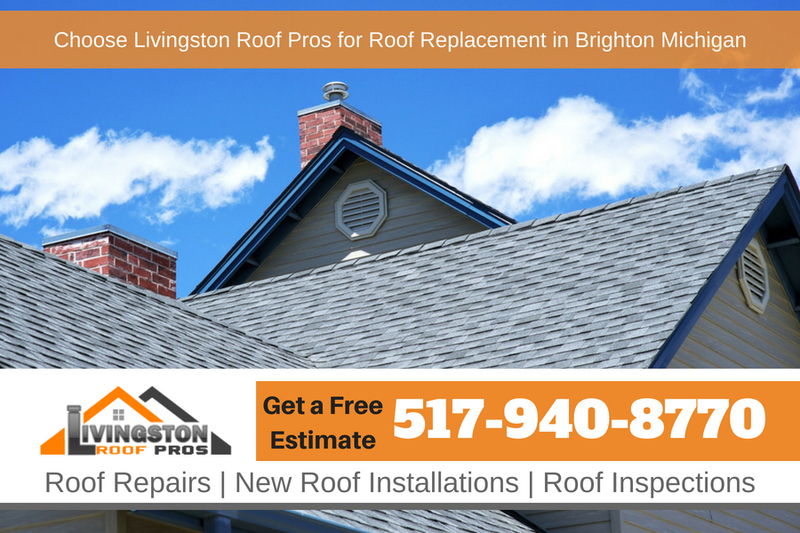 When it’s time for roof replacement in Brighton Michigan it’s best to get a qualified roofing contractor like Livingston Roof Pros to install it. Allowing a roof leak to continue leaking can cause more and more damage to your home. Plus, the longer the roof leak typically the more it will cost to replace the roof simply because of the damage that a roof leak can cause over time. Don’t delay when it comes to your home’s roof, call Livingston Roof Pros today to get a free estimate. As a homeowner looking to hire a roof contractor in Brighton MI for a roofing job, it is fair to assume that you are probably going to be living in your home for the foreseeable future. A roof should provide you with extended durability and functionality. Consult a professional on the longevity of the various roofing materials that are currently on the market. Usually, it is wise to consider paying more upfront, if you are able to, for something dependable that will last a long time. Some components can even last up to 50 years with proper maintenance! Shingles that are made of tile, metal, and asphalt make the list of tried and true materials. Some are even meant to mimic the look of wood or slate. The most common and one of the best choices for roof replacement in Brighton Michigan is asphalt shingle roofing which can last for many years. Of course, a component of choosing a new roof goes hand-in-hand with selecting an exterior design that appeals to you. What is on the outside is just as important as what is on the inside. There are color options and texture options, an endless array. By looking at reference photos, you should be able to determine a general style that you gravitate towards. Your contractor will be able to determine the best option for you based on these references. Nowadays, most roofing materials are designed to look stylish on the outside, even when they are made of more durable material. Fortunately, you don’t necessarily need to break the bank in order to obtain the roof you desire. There are choices available on the market that are designed to look expensive while still remaining functional on all budgets. When you have browsed through your options and selected some that you like the look of, go over the statistics. Keep in mind the climate that you are living in. Does your roof need to endure triple-digit temperatures, snowy blizzards? This is another aspect that your local roofing contractor in Brighton Michigan will have knowledge about. Every roof has unique features that will best suit particular environments. By knowing what your roof can endure over time, you will be able to rest easy while feeling protected as you move through life’s daily responsibilities. You will also save money over time by selecting a smart option. Want to learn more about the options that are available to you and your roof? Call Livingston Roof Pros today at 517-940-8770 for a free estimate on a roofing project in Brighton Michigan.